Species of the order Trichoptera, commonly known as caddisflies or sedge flies, number well over 7,000 worldwide. There are 1,200 in North America, 900 in Europe, and 640 in Australia. They represent a vast group occupying niches in both still and running water. Their greatest diversity is found in and around running water. Distinguishing the species of adult or larva is very difficult and usually impractical when waterside. This situation is not lost on an angler who will find several species present in significant numbers on any given body of water. Fortunately it is relatively easy to identify a caddisfly as belonging to one of five groups: Net-Spinners, Free-Living Caddis, Tube-Case Caddis, Saddle-Case Caddis, and Purse-Case Caddis. By briefly studying these groups we can later apply fishing strategies to match them. Before looking at the groups it will be useful first to outline the life cycle of the caddisflies and look at some common characteristics. This order has a full metamorphosis including stages as egg, larva, pupa, and adult. Their life cycle normally takes between six months and two years to complete. Some adult females lay their eggs in clusters directly on plants and other emergent structure just above the water line. Some crawl or swim below the surface to lay their eggs on stones, rocks, and aquatic plants. While others fly over open water depositing egg masses on or just below the surface. Larvae hatch from the eggs after a few weeks. 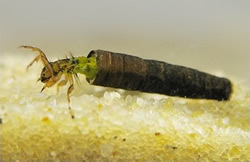 The newly hatched larvae feed mostly on algae and plant debris, though some species are predatory. The larvae pass through five instars and mature after 6 – 10 months. In order to pupate the mature larvae build a cocoon. Pupation takes a further 2 – 5 weeks. The adults then cut their way from the cocoon and swim or crawl to the surface to complete their emergence. Most of the time the adults fly from the water very quickly, though one or two species can be seen to skate on the surface first. Because the adult retains basic mouth parts they are able to drink and consequently live for several weeks. Finally the adults mate and the females return to the water to lay their eggs and complete their cycle. 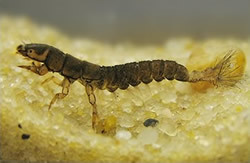 All caddis larvae are grub like in appearance having three pairs of thoracic legs, a segmented abdomen, with two hooked prolegs on the last segment. Many species also have gills along the sides or undersides of the abdomen. Most live in fixed or portable shelters, though one or two predatory species pass through all their larval instars without building a shelter. They are usually green, orange, cream, or brown in colour. The pupae of all caddisflies form within a cocoon created by the mature larva within a hard outer shell. The free-living species build temporary cases similar to those of the purse-case caddis, and create their cocoon within. The case builders simply secure their shelters and seal themselves in before creating their cocoons. The true pupal stage is of little or no significance to the angler. When pupation is complete the caddis emerge as adults enclosed in a temporary integument. These are known as pharate adults, though anglers frequently refer to them as pupae. The pharate adults use their jaws to cut their way from the cocoon and case. Then they swim to the surface to emerge, or crawl from the water up plants, stones, or other structure bridging the meniscus. The pharate adults of many species have long median legs fringed with hairs. These paddle like legs allow them to swim effectively. Their wings and antenna are usually folded back along their abdomen. The pharate adults are coloured shades of green, orange, cream, brown or grey. Their thorax and folded wings often appear much darker. Adult caddisflies have four hair-covered wings held when at rest like a pitched roof over the body. Most species have long antennae, but some have antennae four or five times the length of their bodies. In general, the adults’ wings are dull in colour; mostly shades of brown, grey, and black; sometimes bearing camouflage patterns. Their bodies are similar in colour to those in their pharate stage. The Net-spinning Caddis create tube shaped retreats from silk, sand, gravel and plant debris. These are designed both to protect the larva and to funnel food toward it. Some species also build a net extending outside the entrance to the shelter. This is used to catch food from the water’s current. Amongst the net-spinners are the genera Hydropsyche (illustrated) of the family Hydropsychidae. A species from this group is The Marbled Sedge (Hydropsyche contubernalis). Other families include Philopotamidae, Psychomyiidae and Polycentropodidae. The larvae have heads the same width as their thorax. Unlike the free-living caddis, they have no dorsal plate on the posterior abdominal segment. They occur in varying shades mostly of brown, but also green and grey, and range in size between 5 and 30mm. Fish often feed on these larvae as they drift in the current. This incidence is greatest in the morning and evening when the larvae drift is most heavy. Artificial patterns presented close to the bottom are effective in catching fish feeding at these times. The net-spinning caddis occur mostly in running water but a few can be found at the inlets and outflows of lakes and sometimes along their wave beaten shores. After pupation adult net-spinners swim to the surface to emerge from the pharate integument. Later after mating the females dive into the water and swim to the bottom to lay their eggs. Afterwards they struggle back to the surface. Presenting a soft hackle or diving caddis pattern is the tactic to employ during these phases of the life cycle. Another group referred to as Free-Living Caddis, are found exclusively in cold running water. Like their title suggests they don’t build a shelter, but instead depend on their hooked prolegs to avoid being washed away in the current. The free-living caddis belong to the genusRhyacophila of the family Rhyacophilidae. The Sandfly (rhyacophila dorsalis) is a species belonging to this group. These larvae have heads narrower than their thorax and a dorsal plate on their posterior abdominal segment. They are mostly green in colour, though some are brown or grey, and generally between 6 and 18mm in length. Sometimes called rock worms there are several popular fly patterns dressed to imitate this group. After pupation the adults swim to the surface to emerge from the pharate integument. When they return to oviposit the females swim or crawl beneath the water surface. They frequently drift in the current after egg laying. Once again presenting a soft hackle or diving caddis pattern is the tactic to employ during these phases of the life cycle. The Tube-Case Caddis, the largest group, are characterized by their portable protective cases which they construct with minerals and plant material. Their cases may be finely constructed, fashioned from fine sand into smooth walled tubes. Others may be constructed from large pieces of debris and resemble pieces of twig and leaf. As the larvae grow it is generally thought they build onto the case to accommodate there increasing body mass. They pull their cases around with them at all times. Species vary in size from 7mm to 65mm in length. As they haul themselves around fish will forage for them. Some species of the family Brachycentridae, actually drift in the current in large numbers and fish will feed freely on them. There are several artificial patterns including the ‘peeping caddis’ that should be fished along the bottom either with a very slow retrieve or presented in a free drift. 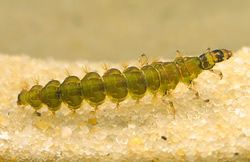 Mostly the adult tube-case caddis emerge in open water. Later the females return to lay their eggs on the surface in open water. Another group is the Saddle-Case Caddis consisting of species from the family Glossosomatidae. They are found only in running water. The larvae use fine gravel to build dome shaped shelters that completely protect them from above. If removed from the water for closer examination, when viewed from underneath the case can be seen to extend in a band passing under the larva, leaving the head and rear of the abdomen protruding from the case. Unlike the tube-cased caddis this variety must build new cases as they grow and at such times are vulnerable to predation. The saddle-case caddis lack gills, measure 5-9mm in length, and are tan or cream in colour. This is another group where the adults hatch in open water. The returning females dive below the water surface to lay their eggs. The Purse-Case Caddis, commonly known as microcaddis, consist of species from the family Hydroptilidae and are the last of the different groups of caddis. Through their first four instars (stages of growth between moults) these species are actually free-living, but in their fifth and final instar they build a purse-shaped case from silk and fine sand. As their common name suggests these are extremely small insects. The larvae are only 2-5mm in length. They inhabit most types of fresh water, are tolerant of warm water, and show a preference for relatively slow sections of river with fine substrate. This is another group where the adults emerge in open water. They also dive below the surface to oviposit. The microcaddis produce rises very similar to smutting. Remember this is a general account of the caddisflies. It should prove sufficient information to help you develop suitable tactics in pursuit of a successful fishing trip. More comprehensive texts can be found within the covers of books found in the bibliography. And it is well worth tracking down local hatch guides for specific hatch dates and species characteristcs. If you don’t already keep a journal it is something you should consider. And if you do, don’t forget to consult it in future seasons! The name Trichoptera is derived from the Greek, Tricho, meaning hair, and pteron, meaning wing; it alludes to the hair-covered wings that identify the order. Spring through autumn. Larger insects typically hatching by night. Expect hatches of smaller species during daylight. Fish feed on pharate adults as they swim to the surface, often in preference to the fly hatching at the surface. Identification of individual species while technically possible is by and large an unnecessary effort. Distinguishing colour and size should be sufficient to guide your fly choice. Spent Caddis patterns can work well when caddis are ovipositing. Use Elk Hair Caddis, Skating Sedge, G&H Sedge or Wickhams Fancy for dry flies; Klinkhamer or Wyatt's DHE for surface emergers; Partridge & Orange or other suitable size and colour hackled wet fly for ascending pharate adults. The larva can be imitated with bead head rock worm and hydrophsyce patterns or peeping caddis. Employ standard dry fly tactics for flies like the Elk Hair Caddis. Impart movement where adult flies can be seen scuttling along the water surface. Standard wet fly techniques work well to fish feeding on emerging caddis. Upstream nymph fishing should be employed on rivers to cover fish feeding on drifting caddis larvae. Caddisflies, Gary LaFontaine, 1981, The Lyons Press. John Goddard's Waterside Guide, John Goddard, 1988, Unwin Hyman Ltd, London. Aquatic Insects and Their Imitations, Rick Hafele & Scott Roederer, 2nd Edition, 1995 (Johnson Printing, Colorado). A field Guide to Insects in Australia, Paul Zborowski & Ross Story, 1995, Reed New Holland, Sydney. Trout Fly Recognition, John Goddard, Second Edition Reprinted 1974, A & C Black, London. A Guide to Aquatic Trout Food, Dave Whitlock, 1994, Swan Hill. Fishing the Caddis Fly For Trout, an interview with Bill Edrington, Ask About Fly Fishing (Roger Maves & Don Bishop), 2006.